Our product range includes a wide range of hand embroidery lace. 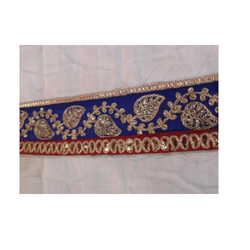 Hand embroidery lace Our company has earned great laurels with Hand Embroidery Lace. The offered lace is very beautifully knitted, to deliver an elegant lace pattern. This one has been designed to give grace and glamour to the attached clothing. It is largely used either as a bottom attachment to the clothing or as a top attachment on the cloth substrate. These are also cost-effective in nature.